I’ve tended the same plot of ground for about 30 years, and this is the oddest winter and spring yet. In almost every year past, the nearby Wallkill River has swelled its banks in early April, then overflowed for a few days to stop traffic on my road. This year, the water level is so low that I’m hoping for some rain. Well, almost hoping for rain. I’m still recovering from last August and September’s record rains that made waterfront property of my home and back gardens. If rainfall hasn’t been whacky enough, just look at temperatures over the past few months and especially over the past few weeks. Here in the Hudson Valley — throughout the Northeast, in fact — winter temperatures have been the warmest in decades. In years past, temperatures plummeted each winter to minus 25 degrees F, less so in more recent years. This winter, temperatures here never went below a balmy pus 5 degrees F. Plants know it: Bamboo (Phyllostachys aureosculcata) stayed green all winter, Chester thornless blackberry was unscathed by cold, and trifoliate orange (a citrus relative!) seedlings did not die back at all. A few more winters like this and I’ll be tempted to try growing southern magnolia (‘Bracken’s Brown Beauty’ is one of the hardiest) and camelias (Sasanqua camellias, which bloom in autumn, are the hardiest), which are among the few plants for which I bemoan living this far north. If the relatively balmy winter was not enough wackiness, how about early spring temperatures? March’s string of daily temperatures in the 70s coaxed blossoms from such plants as Nanking cherry, saucer magnolia (Magnolia soulangiana), and forsythia more than 3 weeks ahead of schedule. Towards the end of March, apple buds were swelling and pears almost popped open. The average date of the last spring frost around here is May 15th. Which is to say is that I’m worried about my fruit crop this year, a worry that has just been propped up the the forecast for a low of 24 degrees F. for tonight (March 26). Whether or not cold kills a fruit bud depends on the depth of cold as well as the speed and stage of bud development. Recent warm weather speeded up bud development, making buds more susceptible to cold. 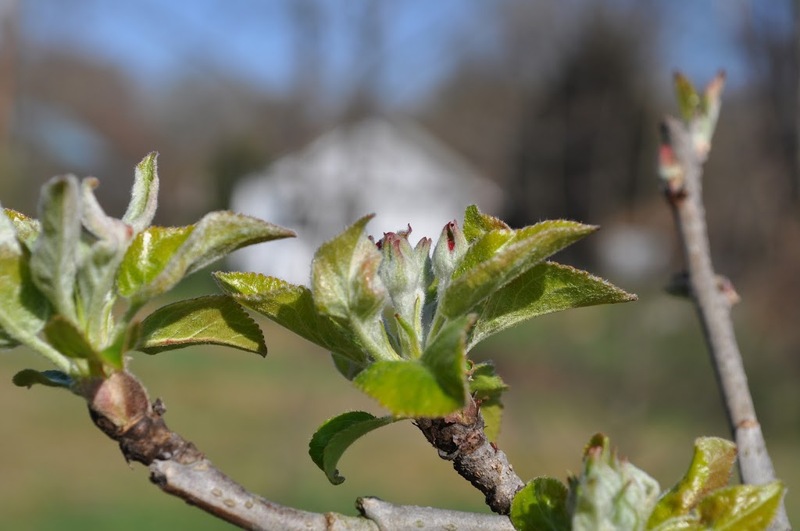 Bud development on fruit plants is divided into self-descriptive stages: apples, for example, go from silver tip to green tip to half-inch green, tight cluster, first pink, full pink, first bloom, full bloom, and, finally, post bloom. Charts are available(http://www.hrt.msu.edu/faculty/langg/Fruit_Bud_Hardiness.html) that give approximate killing temperatures for each stage. For apples, the critical temperatures for the various stages are, respectively, about 15, 18, 23, 27, 28, 28, 28, 28, and 28 degrees F .
So fruit might still be in the offing even after tonight’s predicted freeze. But there’s still many weeks to go before mid-May! What to do? The easiest course to follow now is to just relax and hope for the best. There’s always next year. The green center of this cut bud shows that it’s still in good shape. My trees, even my older ones, are mostly dwarf in size, made that way by special rootstocks. In year’s past, I’ve scurried outside to drape blankets and other coverings over my trees. Coverings add a few degrees of cold protection, mostly for the kinds of freezes (radiation freezes) that occur on still nights with clear skies, by bouncing back downwards the heat that’s being radiated from the earth skyward. I’ve got too many trees to cover. Someone asked me about sprinkling water on their fruit plants to fend off cold. That works, and is sometimes done by commercial growers, if water is applied continuously until it finally melts. The water releases heat of fusion as it freezes. Of course, all that water and ice can lead to limb breakage and saturated soil. Given my number of fruit plants, I’m going with option number one. Well, almost. I have one peach tree, now in full bloom. It’s growing in a pot. Into the garage it will go, protected from cold. The next morning: As predicted, temperatures dropped to 24 degrees F. All plant seem happy but there are still weeks of potential frost damage in the offing. 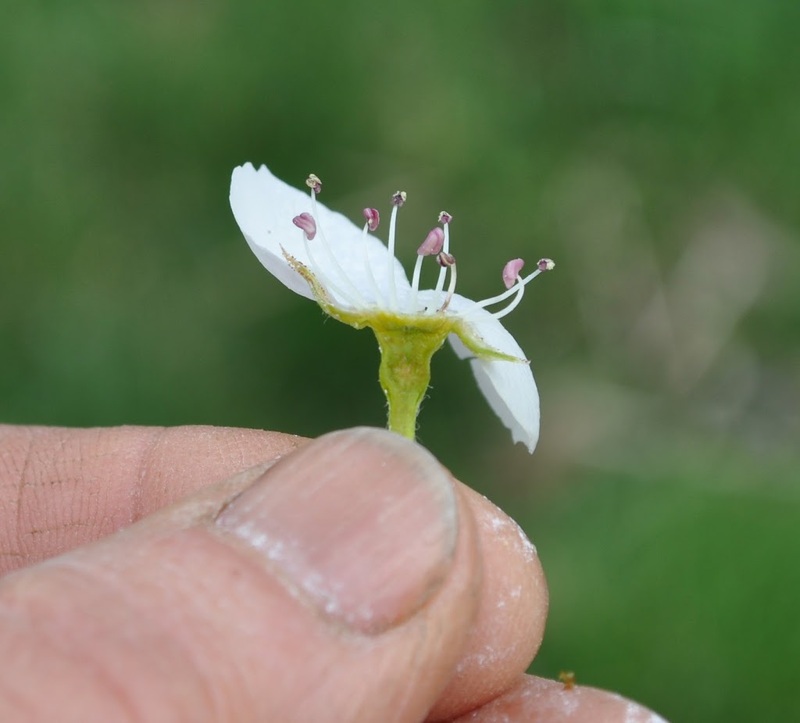 ‘Surround’ controls insects and delays bloom — I hope. My new tack is to slow bud development. This afternoon I sprayed fruit trees, bushes, and vines with ‘Surround,’ which is nothing more than kaolin clay, an effective organic insecticide. The ghostly white coating on the stems should reflect sun’s rays, keeping branches and buds cooler to delay flower bud development. On April 22nd, I’ll be hold ing a pruning workshop, covering the why, when, with what, and how of pruning. On April 28th, I’ll be holding a grafting workshop, covering the how, why, and when of grafting. 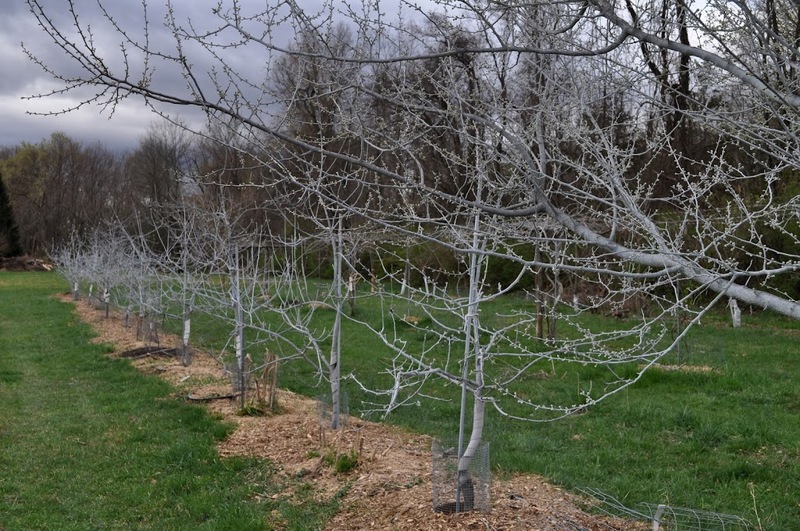 In addition to a hands-on demonstration, participants will graft and take home their own pear tree. This entry was posted in Uncategorized and tagged late frost, Surround, winter chilling, winter cold. Bookmark the permalink. Trackbacks are closed, but you can post a comment. I think many northern growers are worried about their fruit crops this year. The garden forums are abuzz with worries about the weather and different strategies to protect trees. Luckily, I’m just getting started with my fruit growing, so I don’t have much to protect. It will be interesting to see if my Honeycrisp sets any fruit, but since it’s only a few years old, I need to pull off almost everything, anyway. I’m a big fan of your books, I think my favorite is Uncommon Fruits for Every Garden. You and Rosalind Creasy are the reason my husband won’t have to mow the front yard anymore, since it’ll be covered in fruit trees and bushes! Thanks for the Fruit Bud Hardiness link!